In reality, land distribution in this country seems to be only for the agro-industrial and real-estate sectors. According to the National Institute on Agrarian Reform (INCRA), in 2007 and 2008 the concentration of land owned by foreign capital, most of it from the United States and Europe, increased by 12 kilometers a day. Adenilson da Silva Nascimento, a 54-year-old indigenous man better known as Pinduca Tumpinambá, grew up and lived his entire life in his village in the region known as Serra desTempes, Olivença, in the northeastern Brazilian state of Bahia. This year, on the first of May, he was returning from a day’s work fishing with his wife and two of his six children – a one-year-old baby and a girl of 15 — when they were ambushed by three armed, hooded men who instantly killed Pinduca. His wife Zenaildes shielded the baby with her body and received serious gunshot wounds to her leg and back. Their daughter fled through the forest, maintaining cell phone contact with members of the village, who called the authorities. The indigenous leader María Valdelice, better known as Jamapoti Tumpinambá, says that this is not the first time something like this has happened. She says it all has to do with their indigenous lands and the people interested in them. “There have been more than 29 indigenous killed in just three regions of Tumpinambá lands in the state of Bahía, between 2013 and 2015. The government bears responsibility because they have not delineated our lands and there are people claiming these lands for themselves,” Jamapoti told the Americas Program. Two days later, in another village named Pambú, which belongs to the Tumabalalá people in the municipality of Arabé, a 40-year-old indigenous man named Gilmar Alves da Silva, was hit by a car while he was returning home on his motorcycle. Then, while he was on the ground, he was shot several times. Gilmar was able to tell part of the story himself; he had strength to return to his village by motorcycle, but died soon after. This made three murders in a two-week time period from late April to early May, all with the same modus operandi. Eusébio Ka’apor, from the Alto Turiaçu indigenous territory, in the state of Maranhão, was assassinated April 26; he was shot in the back. 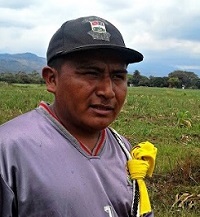 CIMI also maintains that these assassinations are linked to the racist discourse of members of the National Congress, specifically the congressional faction known as “ruralists,” who have paralyzed the process of demarcation of indigenous lands and openly favor transnational corporations. According to CIMI’s records, the assassinations of indigenous people in Brazil have occurred over several governments. In the administration of Fernando Enrique Cardoso (1995 – 1998 and 1999 – 2002) 167 assassinations of indigenous persons were registered. During the administration of Luiz Inacio Lula da Silva (2003 – 2006 and 2007 – 2010) the number of assassinations rose to 452. In 2011, President Dilma Rousseff’s first year in office, 51 killings were recorded, and in 2012 there were 57 more. In reality, land distribution in this country seems to be only for the agro-industrial and real-estate sectors. According to the National Institute on Agrarian Reform (INCRA), in 2007 and 2008 the concentration of land owned by foreign capital, most of it from the United States and Europe, increased by 12 kilometers a day. In 2010, this represented an accumulation of more than 4.5 million hectares, concentrated in the states of São Paulo, Bahía, Minas Gerais and Mato Grosso. Added to this are the vast extensions of territory that the federal government grants to mining, petroleum, clean energy, and other interests – all in the name of economic growth. “We no longer believe in the government because it is all set to have Congress approve congressional amendment PEC-215, which denies our right, our ancestry, and our spirituality. The government is already dominated by the multinational soy, eucalyptus, and corn industries. The ruralist caucus in Congress has no interest in meeting the needs of Brazilian society; on the contrary, they want more growth and they either order us to be killed or they send in the police and the military,” Ytajibá Souza, one of the indigenous leaders of Tucum village, told the Americas Program. In reference to the distribution of lands for agroindustry, the ecological economist Joan Martínez Alier, in his article Sudamérica: el triunfo del post extractivismo en el 2015, refers to neoliberal and progressive countries that persist in promoting primary exports to the point of saying that in order to have less extraction of raw materials, there has to be more. Martínez said that a ton of raw materials that is imported has always been more expensive than a ton that is exported, even at the height of the boom in the price of prime materials “… Peru, Brazil and Colombia export, in tons, much more than they import, and they can’t even pay for their imports,” says Martínez Alier. In 2012 the organization GRAIN reported on an investigation of the intermediaries for multinational corporations in the countries where the most land grabbing is taking place. To cite just one example, in Brazil José Minaya, general manager of the Teachers Insurance & Annuity Association – College Retirement Equities Fund (TIAA-CREF) in the United States, has seen to it that the retirement savings and investments of U.S. professors are channeled into the expansion of sugar cane, among other projects in Brazil. Sugar cane, along with other types of plantations, is characterized by the use of slave labor, destruction of ecosystems, and theft of indigenous lands. According to GRAIN’s report, 3 percent of the population of Brazil own nearly two-thirds of arable land. Thus, the assassination of Adenilson is not an isolated situation, Carlos José F. Santos an indigenous professor at the State University of Santa Cruz (UESC), insists. “It is important to point out that Pinduca was an indigenous leader respected for his clarity about our rights, about our indigenous way of thinking that is contrary to the interests of the ruralists —owners of vast expanses of land— about capitalists and predatory development. This made many people uncomfortable,” Santos told the Américas Program. “People from NGOs and the government have come to talk about REDD [Reducing Emissions from Deforestation and Forest Degradation program, the platform for a market for the exchange of carbon credits, or pollution permits, by the world’s corporations that produce carbon dioxide emissions] and protected areas, but we are careful, because there is always something else going on behind the scenes. Without these programs, we are taking care of our Mother Earth. Moreover, we know how to take care of her and do our own monitoring; the government has no reason to get involved,” Ytajibá said. Another form of concentration of land ownership in Brazil has taken place through ecological colonialism, where land is granted by means of national and transnational agreements to non-governmental organizations (NGOs) to be administered by them. These organizations include the Canadian International Development Organization (CIDA); Ford Foundation, Club 1001; Both Ends; Survival International; Conservation International (CI); Inter-American Foundation; MacArthur Foundation; Rockefeller Foundation; W. Alton Jones Foundation; World Wildlife Foundation; Summer Linguistics Institute (SIL); National Wildlife Federation (NWF) ; The Nature Conservancy; European Working Group on Amazonia (EWIC); and International Union for Conservation of Nature (IUCN). These organizations, among others, have interfered in regional and federal planning for the conservation of areas denominated as Protected Areas, where speculation takes place with so-called carbon credits – designed to allow countries or industries from wealthy countries to continue to pollute while other countries, such as Brazil, conserve their ecosystems – that directly affect indigenous communities. 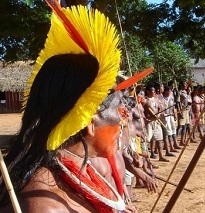 The National Indian Foundation (FUNAI), in an anthropological report about the ancestral lands of the Tupinambá, acknowledged the presence of at least 4,700 members of the Tupinambá indigenous group, concentrated in at least 23 communities between the mountains and the coast in the state of Bahia. In the same study, the FUNAI acknowledged that more than 47,000 hectares are Tupinambá lands. 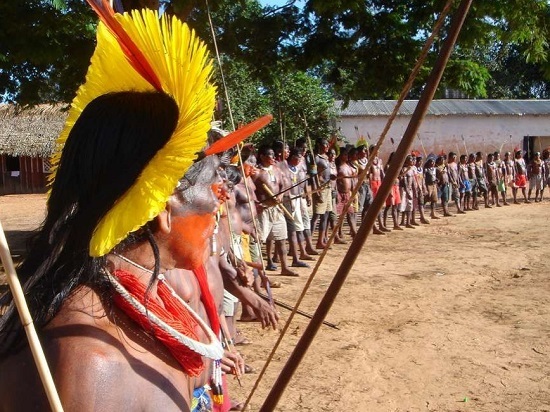 Nevertheless, the Brazilian government has failed to officially recognize these lands as belonging to the Tupinambá. Since 2004 , several Tupinambá villages have reclaimed for themselves at least 80 percent of the territory officially recognized by the FUNAI report. The Tupinambá are one of the few indigenous peoples of Brazil who have dared to demarcate their borders on their own and occupy those lands. They have expelled ranchers, landowners and others who had power over enormous amounts of land, some of which were destined to become tourist complexes with luxury hotels and restaurants. Meanwhile, on May 7 in the village of Patiburi, in Belmonte, when everyone was harvesting their cacao, two houses were set on fire, along with part of their plantings. According to a CIMI report, these actions against the village of Patiburi have intensified since the end of 2013, when the delimitation of territorial borders and the reports of the FUNAI studies were published in the Diario Oficial del Estado [Federal Gazette]. “The government had an opportunity to directly negotiate with us, and I think that opportunity is over. Because we can already see that we don’t have a space for dialogue, and because decisions are made without consulting anyone. And our young people have to prepare for a new moment of struggle. Because we have the time of our rituals, of planting and harvest, but we also have the time of war. If we don’t die, we cannot be born anew, and if they do not want to establish those borders, we will occupy and we will fight to the point of offering our lives to the spirits — our ancestors — if it’s necessary,” insisted Nadia Akauã.